Almost ten years ago, 21-year-old Columbia University undergraduate David Epstein stood at the gaping entrance to the West 116th Street subway station in uptown Manhattan, a large backpack slung across his shoulders. The backpack looked normal enough from the outside, but inside it housed a customized, portable pump that could filter tiny metal particles from the surrounding air. Armed and ready, Epstein started down the stairs to begin an eight-hour scientific mission to gauge how polluted the air in New York City’s subway stations really is. A decade later, there is still no clear answer, and plans for further research in the world’s second-largest subway system (only London’s Tube has more miles of track) have been blocked by the Metropolitan Transit Authority. While the Columbia study found that subway workers were not being exposed to toxic steel dust and other pollutants above federal workplace safety limits, there could still be dangers. There has been no effort to look for subtle, long term health effects that could affect workers exposed to levels of pollutants that fall within the official limits. Recent studies in international cities (like Paris and Seoul) have suggested that toxic pollutants — including manganese and chromium — may be present in the ambient air of underground transport systems, creating toxic environments for workers who spend much of their time underground. There is an important need for further research to elaborate on the relationship between airborne pollutants in subway stations and public health. But, “to do any further studies, we need to find funding first,” says Steve Chillrud, an environmental geochemist at Columbia University’s Lamont-Doherty Earth Observatory and the man behind David Epstein’s 2001 mission. Certainly the potential for damaging health effects is high, especially for vulnerable populations such as asthmatics, the elderly, children and veteran subway workers. More than 4.3 million New Yorkers take the subway daily. At least another 38,000 people work in this microcosm, repairing equipment, driving trains and welding tracks. Chillrud had originally zeroed in on the subway because of the unforeseen results of a previous project. In the winter of 1999, the TEACH study, the Toxic Exposure Assessment, a Columbia and Harvard study, followed 38 New York City high school kids outfitted with custom designed pump-backpacks. Their aim: to figure out where these inner-city teenagers were being exposed to the highest levels of urban air toxics. The results: The backpack samples had much higher levels of toxic metals than the air samples collected from the students’ homes, schools or the outdoors. Friction is the most likely culprit for underground steel dust. As wheels scrape rails, the impact of steel on steel causes clouds of large, angular steel shavings to rise. So when a train thunders into a station, screeching to a halt at the platform, it is kicking up a massive steel dust fuss. These particles are recognizably different from steel dust particles on the street, says Chillrud: larger in diameter, enriched with iron, manganese and chromium and heavier by weight. To explore this further, Chillrud measured students’ exposure levels to steel dust, defined as underground metal particles with a diameter smaller than 2.5 micrometers. The findings, a part of student David Epstein’s undergrad thesis, were below federal safety standards for occupational exposures. In the second part of his study, Chillrud also looked at the effects of this dust in a small, random group of subway workers. He measured for short-term stress indicators in the workers’ blood and urine samples, including DNA damage. The good news was that these indicators did not seem to increase with higher exposure to steel dust. The bad news: No one looked at long-term effects of metal poisoning. We already know that manganese, iron and chromium can be particularly malevolent metals. Herman Gibb is an environmental epidemiologist who worked at the U.S. Environmental Protection Agency and is now the president of Tetra Tech Sciences, a private environmental consulting company. His major interest is toxic metals in humans; and chromium tops the list. Gibb says that hexavalent chromium, one of the two forms of the metal, “is certainly the most carcinogenic of all elements we know. Although this form of chromium is not usually found in steel metal, steel welding (often performed in the subway) is known to create hexavalent fumes. The Columbia scientists believe the noxious chemical could pervade the subway, but since only total chromium was measured, they cannot be sure. Chillrud says that a follow-up study could rectify this discrepancy by looking specifically for hexavalent chromium. Exposure to manganese and iron — the other components of steel dust — have been linked to neurodegenerative illnesses like Parkinson’s disease. Studies have shown that concentrations of 31 parts per billion (ppb) can lead to neurological changes and elevated manganese in people’s blood and urine. However, the maximum levels of exposure found in the Columbia study were about 0.9 ppb, well under this lower limit. Chillrud’s study showed that the concentration of steel dust from Epstein’s eight hours in the New York subway was 27.5 ppb. This figure is at least two magnitudes smaller than what’s listed in the Occupational Health and Safety Association guidelines, over 8 hours of exposure. Some evidence suggests that even low-level exposures may have a biological effect. In 2006, medical bioscientist Hanna Karlsson at the Karolinska Institute in Sweden discovered that many of these subway particles undergo a toxic transformation when they contact cellular DNA. Once inside a cell, they become what chemists call “free radicals” — molecules with an unpaired electron in their outer orbit. This means their chemical reactions can destabilize our DNA by mutating its sequence; in turn, these mutations could lead to cancer and other chronic diseases. Currently, there is no experimental evidence for this in people exposed to steel dust. Not only would scientists learn from further experiments, but more importantly, research would benefit the people who have spent years working in the cavernous depths of the subway. In November 2001, Steven Chillrud began calling Goldsmith repeatedly. Chillrud had just got the results from David Epstein’s backpack expedition and was worried. 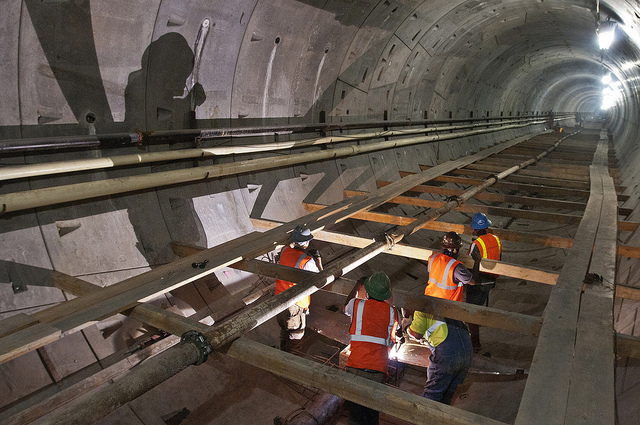 “We wanted to look at workers in the subway systems because they should be exposed to even higher levels and we might have seen hints of health effects,” Chillrud says. Although the results from the study did not seem to be significantly negative, there was still need for further research. Health outcomes of steel dust pollution are much more visible over prolonged exposure times — respiratory disease can take 15 to 20 years to develop. But the workers studied were not picked from among the most experienced. “The question is what workers did you look at and how many years have they been on the job?” asks Goldsmith. In fact, Dr. Frank Kelly, an environmental health professor at Kings College, London, believes there are almost no long-term or “chronic” studies looking at this issue. “I’m not aware of any occupational studies done in this group of workers, which have been carried out over the time period needed to confirm [health effects],” he says. To fill the gap, Goldsmith decided to take matters into his own hands. In the winter of 2008, he approached the National Institute for Occupational Safety and Health (NIOSH), for the vital ingredient: money. The idea was to look at medical insurance claims being made by workers of the Metropolitan Transport Authority, according to their job titles and experience, and look for patterns in their illnesses. The proposal passed the internal NIOSH review and was approved for funding in early 2010. “To do the study, we needed approval from MTA for release of the medical claims data,” says Fred Blosser, a NIOSH Press Officer, in an email. Surprisingly, permission was denied. “Because MTA did not provide approval, we were unable to proceed,” says Blosser. And the one million dollar study ground to a premature halt last year. The MTA says it was worried about worker confidentiality. While agency spokeswoman Deirdre Parker declined to be interviewed, she did forward a February 2010 letter from the MTA NYC Transit President, Thomas Prendergast, to the NIOSH. The proposed study, writes Prendergast, “raised considerable business, policy, legal and ethical considerations surrounding the wholesale transfer of health claim information,” without informed consent from all those involved. The Transit Workers Union wants to take legal action. “Our President John Sanderson…wants to sue them,” says Goldsmith. The union’s lawyers have been looking at the issue for the last few months. If they feel there is a strong case, Goldsmith says, they may sue. Until the legalities are untangled, the situation is “at a stalemate,” says Markowitz. David Epstein, now a journalist at Sports Illustrated, has moved on from his undergraduate thesis. But he’s “definitely curious” to know what happens next, he says. At the West 116th Street subway, before the next train comes in, workers in bright yellow jackets drill furiously at the far end of the tracks, sparks and steel flying in their faces. As the Number 1 train pulls in noisily, the workers are hidden from view. Their story remains unfinished. Straight Forward Worker’s Compensation on dust exsposure is the Flour Mill decision. Any dust will lead to right ventricle failure… Heart attack. .. Interesting aspect is the addition of elements of the steel. Ofcourse Tom Prendergast and all those other people withholding worker’s comp benefits from worker’s dying of cancers. I, myself have a settlement for three and half years that the Inspector General of the MTA looked into for me and found it to be “languishing on some clerks desk”. Thank G-D its not for cancer I suffer from. My case for WC benefits was first filed in 1991, and the Transit fought me and harrassed me every step of the way. I won $50,000 for Race Discrimination, and now live on Social Security Disability and Medicare. At the Railway and Transport Strategy Centre in Imperial College, London, we have almost completed a study on heat and air quality in metro railways (what you New Yorkers call subways). Your piece occurs just at the right time! Other research on this subject suggests that particulates of with a diameter or 2.5 and 10 micrometers are not a problem. However, we were not previously aware of research into particles smaller than 2.5 micrometers. On the other hand, Dr Frank Kelly may not be “aware of any occupational studies done in this group of workers, which have been carried out over the time period needed to confirm [health effects]”: I wonder if he has seen the 2003 paper by FINTAN HURLEY, JOHN CHERRIE1, KEN DONALDSON,ANTHONY SEATON and LANG TRAN on ASSESSMENT OF HEALTH EFFECTS OF LONG-TERM OCCUPATIONAL EXPOSURE TO TUNNEL DUST IN THE LONDON UNDERGROUND? There was also a paper by RATP in Paris which found that their workers lived longer than workers in similar occupations. I am concerned by the rather alarmist tone of your article and its reckless attitude to data protection. All the research we have read so far suggests that such particles are not nearly concentrated enough to cause problems, even long term and even to workers, who are exposed at least 4-5 times longer than passengers. But equally, if you do have any evidence that this is not the case, we would really like to hear from you. The OSHA (in New York State its Public Employee Safety and Health) law requires monitoring for hexavalent chromium. The MTA must do this and the workers have access to the results.